UCI Health uses Duo Security to add a second layer of security when accessing protected systems and services. Passwords are increasingly easy to compromise. They can be stolen, cracked, or guessed. 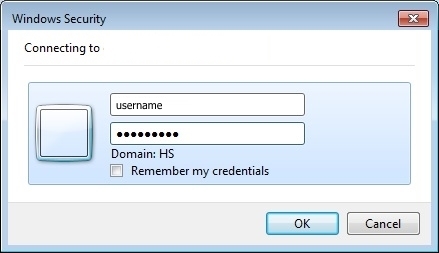 Two-factor authentication adds an additional layer of security to your HS account by mitigating password compromise. By verifying your identity using both something you know (your HS username and password) and something you have (such as a mobile phone and/or landline), compromised password cannot be used by itself to log in. *Mobile phone is the recommended option as it is typically with you and you can take advantage of the Duo Push option for the easiest two-factor authentication. When a service is enabled for Duo Two-Factor Authentication and you have not logged into it before, you'll need to enroll at least one second factor device in Duo. Enter your phone number, then click on the checkbox to confirm your number. Following the instructions on your screen, on your mobile phone, download and install the "Duo Mobile" app from the Google Play Store (for android devices) or the Apple App Store (for Apple devices) if you do not already have the mobile app installed. Click "I have Duo Mobile installed" once you have the mobile app installed. Your unique barcode should now be displayed on your computer screen. Following the instructions on your computer screen, on your mobile phone, open the "Duo Mobile" app, tap the "+" button (at the top of the screen), then scan your barcode on the computer screen. You may now set the preferred authentication method for this device. The recommended option is "Automatically send this device a Duo Push". Click the "Save" button when done. You're done enrolling. If you're on a shared workstation, please close your web browser since you're logged in. Duo is required by all UCI Health staff, students, faculty, and affiliates for any system that is Duo-integrated. Access to UCI Health systems from within the hospital and clinics is not affected. 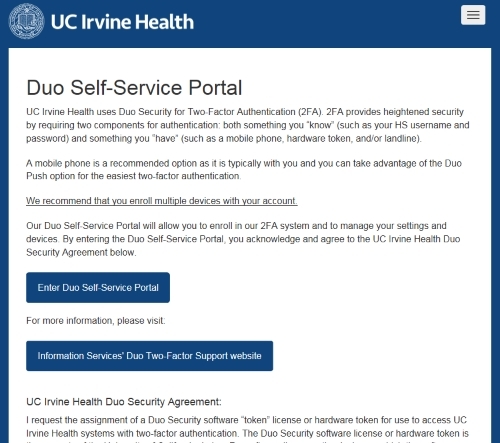 What UCI Health services use Duo authentication? Mobile phone is the recommended option as it is typically with you and you can take advantage of the Duo Push option for the easiest two-factor authentication. You can also enroll a non-smart phone or a landline such as your dedicated office number or home phone. I will use the Duo Security token only in accordance with UC Computer and Network Use Policies (e.g., http://www.policies.uci.edu/policies/pols/714-18.html) and only for University business. If the token is used in such a way as to compromise University computer security, I will notify UCI Health Information Services and return the Duo Security hardware token or remove the Duo Security software, as applicable. If my employment with UCI Health and/or any other business relationship with the University of California, Irvine is terminated, I will notify UCI Health Information Services and return the Duo Security hardware token or remove the Duo Security software, as applicable. If either the Duo Security hardware token or the device on which the Duo Security software is installed is lost or stolen, I will notify UCI Health Information Services immediately. If I believe my existing Duo Security hardware token or device containing the Duo Security software may have been compromised, I will notify UCI Health Information Services. Whenever requested by the UCI Health Data Security Team, I will return the Duo Security hardware token or remove the Duo Security software. I will store the Duo Security hardware token or the device on which the Duo Security software is installed in a safe place at all times. I will not share my password with anyone at any time, nor store the first factor password with the second factor token at any time. I will not register a device unless it is absolutely needed for University business. What should I do if I replaced the phone I enrolled in Duo? If you are using the phone call or text message option to authenticate with Duo instead of using Duo Push, no action is needed. Click on "Reactive Duo Mobile"
Click on "I have Duo Mobile installed"
Open the Duo Mobile app on your phone, tap the "+" button at the top of the screen, and scan the barcode on the screen. Enter the new phone number, click on the checkbox to confirm the number and click on "Continue"
Why do I need to use two-factor authentication? Two-factor authentication enhances the security of your HS credential by using a device you own to verify your identity when you access UCI Health systems. What if I get a Duo Notification that I did not request? Why do I automatically get denied access? I was never given an option to Approve login or to enter a passcode. If you are getting denied access by Duo after successfully authenticating your HS account, you are likely locked out of Duo. This usually occurs when 10 attempts to authenticate with Duo either have timed out or failed. You will need to contact the UCI Health Service Desk to unlock your Duo account. What if I forgot my device and need access? If you do not have your enrolled device with you and needing access, you may contact the UCI Health Service Desk for a temporary passcode. The passcode will expire after 13 hours. What do I need to know if I am traveling? Please refer to Duo Travel Guide. Also, you will need to fully shut down the laptop instead of letting it sleep or hibernate before you board your flight or enter an area that does not have internet access. If you do not fully shut down, you may get prompted for two-factor authentication and may not be able logon until you either gain internet access or until you force shutdown and restart your laptop. A mobile Phone is the recommended option as it is typically with you and can take advantage of the Duo Push option for the easiest two factor authentication. Can I setup Duo on more than one device? You are encouraged to register more than one device (mobile phone, office phone, tablet) for two factor authentication. If you forget your phone or something happens to your phone, you will need another way to authenticate. What should I do if my enrolled device is lost or stolen? Please contact UCI Health Service Desk at 714-456-3333 or 949-824-3434 immediately if your enrolled device is lost or stolen. The Service Desk will assist with the deactivation of your lost/stolen device and enroll your new device. Will I be able to authenticate with Duo if I don't have a cell signal or WiFi connection? You can generate a passcode in the Duo Mobile app on your mobile phone by tapping the key icon next to "UCI Health", then log in to the system using the passcode. If I choose SMS message or phone call option, will I be charged by my phone carrier? If you do not have an unlimited cell phone plan, you may be charged by your carrier for SMS messages or phone calls.